The aggressive pressing inside the opponents half has two reasons. For starters, if the ball is won immediately, you catch an opposing team when they are still transitioning from a defensive to a more attacking phase, which means their organisation is often poor and your players can go through on goal with a single pass. Let me show you what I mean. What we can see is that the left attacking midfielder, Vankan, is quite aggressive as soon as the keeper releases the ball towards a defender. When he intercepts the ball, the defence is in disarray. They planned to build up an attack so most defenders are spaced far apart. A quick break and a single pass sees Kadir Kurt with an easy shot inside the box and a quite simple goal. The entire goal is made possible because of counter-pressing. 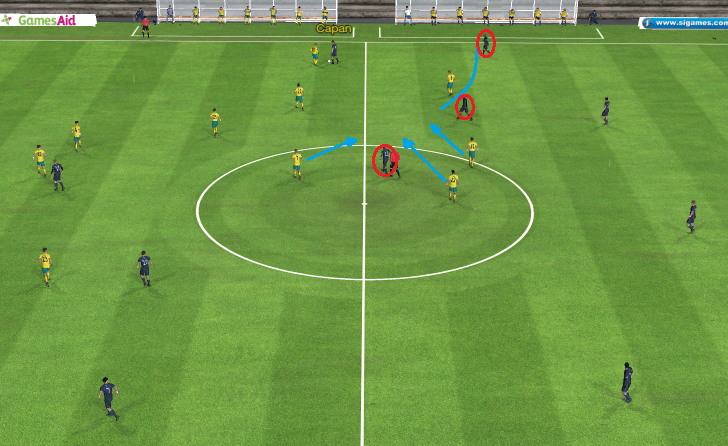 The second reason why I want my team to pressure deep inside the opposing team’s half, is to cut off the passing options an opposing team has, disrupting their build-up play as early as we possibly can. Ideally, you want to force an opposing team into playing risky back-passes or pointless long balls forward. If you manage to pressure your opponents into giving the ball away recklessly, you can again catch a defence off-guard and benefit from their lack of organisation. Let me show you what I mean. Juventus are unable to clear the ball effectively, because of the relentless pressing. Their defenders are immediately pressured into clearing the ball without looking for a team-mate, which means our team, moving forward as a cohesive unit, is able to win back possession quite high up the pitch. Looking at the post-match analysis from this specific game against Juventus, we can see that most interceptions happen around the mid-way line, the result of my players picking up poor clearances or rushed long balls from the Juventus defender. We can also see a fair few interceptions closer to the Juventus box, leading to goals like the one from the first match clip. The green dots represent successful interceptions, the yellow ones represent a missed interception and the orange one represents a blocked shot. I started off claiming extreme pressing was a prerequisite for strikerless success. Because you lack a focal point for your passes upfront, you are heavily reliant on pass and move strategies and desorienting the opposing defence, creating disarray by overloading or pressuring them into making mistakes. Allow me to show you yet another match-clip. Straight from the kick-off, you can see my team snap into tackles, swirl around their opponents, pressure them, even deep in their own half. It was a remorseless, bewildering assault, the opposing team was given no quarter, no respite anywhere on the pitch. It paid off with a goal in this instance, but I want my players to have this mind-set all the time. When we break down this clip, we can see three different instances where counter-pressing is used to swiftly regain possession and carry on with an attack. First up is this following situation. The red circles represent the passing options the Juventus player in possession has, the blue lines represent the defensive movement my players can make. Juventus winger Capan is closed down on the wing by my wing-back Schramm. He only has three realistic passing options, all three of which are virtually cut off by my players. In case of a back-pass, the outer midfielder can simply block the passing lane. A pass to the more central player would be extremely risky, with three of my players nearby who can either intercept or immediately challenge the intended recipient. The second phase shows a similar situation. Let’s have a look. The red circle represents the intender recipient of the pass, the blue line represents the defensive movement my player made. One of my players dallies on the ball and is muscled off the ball by a Juventus midfielder. Within seconds, the ball is won back by a midfielder surging forward to re-claim the lost ball. Even a short pass over a few metres can be intercepted if the pressing is relentless and swift. The match clip shows this, as the ball is won back almost instantly. Counter-pressing again. The third situation is another prime example of counter-pressing. The blue circles represent the defensive pairings. The header is cleared forward, more or less immediately relinquishing possession. The screenshot shows the defensive pairings made and there is actually only one Juventus player left unmarked, their left-back. Heading the ball side-ways towards him would probably result with him being pressured by my right midfielder, who is coming in behind his opponent, which would be an extremely risky approach to take. All in all, almost every passing option was blocked or cut off by my players, forcing Juventus to give up possession quite easily, as well as catching their team off-guard during a transitional phase quite high up the pitch. Now imagine what would happen when the midfielders would not actively close down their opponents, instead opting to drop back into midfield, maintaing the defensive shape. The premisse of a strikerless formation is that your side is going to dominate by having more men in midfield, drawing in opponents and then exploiting the space they give away. If an opposing defender can take control of the ball and either pick out a pass unopposed or even worse, dribble into a midfield position, negating the numerical advantage you once had. By keeping the opposition pinned at the back, you force them into a long ball or reckless pass and allowing your midfielders to win the ball. 1. I absolutely do not agree that strikerless formations necessarily require a high-pressing, high-possession style of play. I’ve had great success with both a counter-attacking and possession-hungry versions of the 4-1-2-3-0 that I prefer to use. Like most systems, it’s incredibly flexible and can be moulded to suit whatever philosophy you want to follow. 2. It may prove useful to give people an indication of HOW you implement this kind of system in FM. Is it through an attacking mentality with a high-line and ‘hassle opponents’ enabled? Is it personal instructions for the 3 AMC’s? Is it through employing players with high work-rate and stamina? A combination of all three? I hope that doesn’t come across as too critical. Enjoyed the article but just a couple of thoughts. No offence taken at all, Shrew. Regarding the points you made. (1.) I suppose you are right and it could be tailored to fit any style and any sort of match plan, but the premisse of a strikerless tactic is to outnumber the opposing midfield, lure the defenders forward and quickly break to exploit the space. Pressuring them into making mistakes and subsequent disarray defensively just speeds up the process for me. Though to be fair, pressing at the half-way line could achieve pretty much the same I suppose. (2.) I hadn’t actually considered this. 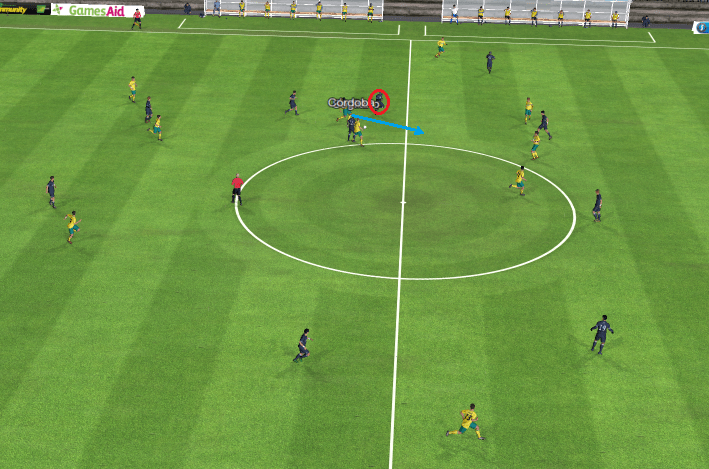 I was going to do a post with a download-link about the latest version of the tactic, I think I will encorporate the workings of the pressing into that post. It’s a complex system, because the pressing doesn’t work without the high defensive line and a bunch of the other team instructions. They all interact and it’s the combination of all of those instructions that makes it work, so I reckon a description of these interacting instructions deserves a new article. 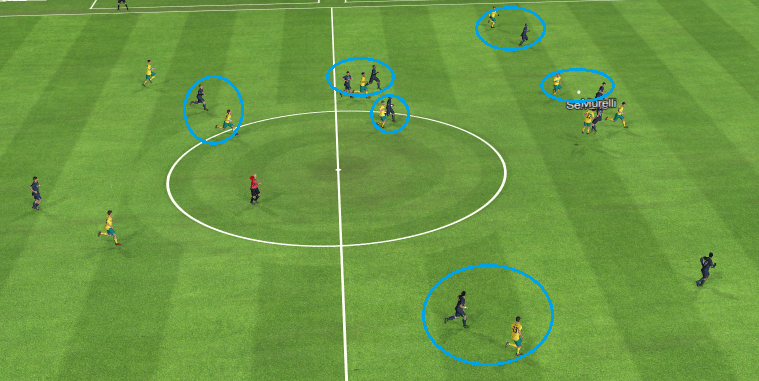 I intend to write a more detailed post, but it’s a combination of various team instructions such as Hassle Opponents and Push Higher Up, an Attacking mentality which pushes the players higher up the pitch and a Very Fluid setting, which makes the entire team contribute to the hounding of opposing players. That’s exactly how I set my team, Attacking and Very Fluid (Total Football), Hassle, Push Higher Up, but also with intention of having very high possession. But it’s impossible to do it, when players ignore opponents instead of pressing them. To be fair, my squad is fairly world class all over the place, that does tend to help. You should be able to replicate it. I don’t think the formation and roles are that big of an influence. Well, as said, I’ve sent several games to SI servers logged as bugs with examples of players ignoring their opponents and not pressing at all. When it comes to just having players standing with no reaction or with a significant delay on their reaction, leaving opponents free to run with the ball, I don’t know what can be done. That’s why I’ve got curious with your fine article, because it seems you don’t fell this problem. I agree with Shrewnaldo and Michael, I would be very interested to see how you implemented this in FM, so I’m looking forward to your next article. it’s a given 🙂 and keep up with your excellent work. How can i download the pressing tactics? Counter and Agressive?